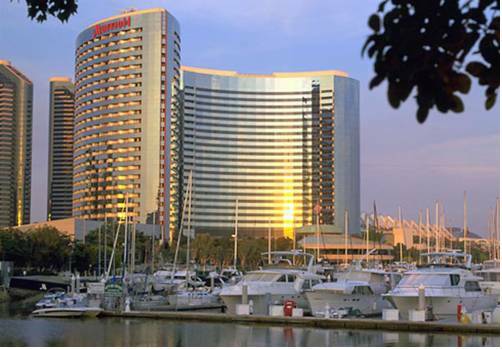 Whether you are in town for business or a waterfront getaway, you'll value the charms of Marriott Marquis San Diego Marina. Our downtown hotel overlooks our private marina and is close to area attractions, including Seaport Village, San Diego Convention Center, Petco Park, Balboa Park and the Zoo. Every room and suite has incredible views of downtown or the San Diego Bay. Recharge on the plush bedding and enjoy the cozy reading chairs, flat-screen TVs, ample desks and Wi-Fi; many rooms boast balconies. Concierge-level rooms grant access to Lounge perks, including free breakfasts, while suites also benefit from expanded living areas. After a busy day in San Diego, pamper yourself at the day spa, work out in the gym or take a dip one of our two outdoor pools. Our restaurants invite you to indulge on creative American, Mexican and Asian-fusion fare. Event planners appreciate our recently redesigned indoor and outdoor venues, combining for more than 276,000 square feet of space, with state-of-the-art technology. Marina Kitchen Restaurant & Bar: The award-winning Marina Kitchen Restaurant & Bar has reinvented comfort food with creative takes on American favorites. Savor every bite while enjoying the incredible views of the San Diego marina and Southern California coastline. Tequila Bar & Grille: Step into our tropical pool area and enjoy dining on the Baja Mexican cuisine of Tequila Bar & Grille. This casual restaurant offers delicious fare, one of the largest tequila menus in the world and an inviting resort atmosphere near the San Diego marina. Roy's: If you are craving innovative Asian-fusion fare, Roy's in our San Diego hotel is a 'must try.' This popular restaurant tempts with fresh seafood entrees and much-lauded sushi rolls, as well as unforgettable views of the marina. Exchange: Whether you enjoy dining in the privacy of your room or your busy schedule requires meals on demand, try Exchange. Order delicious restaurant cuisine from 6 a.m. through midnight for delivery or stop by to pick up your favorite dish after a long day. Starbucks : Begin your morning with rich coffee, delicious pastry or other tasty snacks from Starbucks before heading off to meetings or to explore San Diego, California.